You might remember last year when Bailey, Jo and I went to the Elizabeth's Antique & Collectible Sale at the City Centre Airport and had a blast. So when it came around again this spring (there's also one in November), Bee, Jill and I (Jo has since moved to Calgary and we miss her!) hit up the show bright and early on a cold and blustery Saturday morning to see what treasures we could find. Once we arrived, people left and right remarked "Oh, you came again! You must have heard Marlene talking about you on the news." Say what? I neglected to take my camera but the wonderful Sheree Zielke shared some of her photos with me. I am on a very strict budget of NO MONEY but still managed to make a few practical purchases. The first was my first piece of Bakelite ever - a dark green buckle ($4) for my Datemaker cardigan. 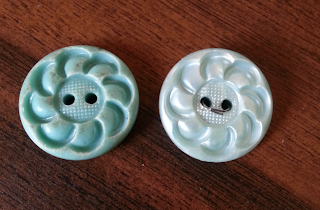 I also bought a set of 5 buttons for $1 because I thought they matched some other vintage buttons I had a home. They're the same style, but the colour is off. The one I bought it on the left, my original on the right. There was another vendor with a TON of vintage buttons and I regret not going over their booth more than I did. Next time. Other than that, all's quiet on the home front. I am soooo close to finishing this Datemaker cardigan, with about 6 inches left on the belt to knit. Then it's blocking and seam time! Here's hoping I have it done to wear out Friday night. 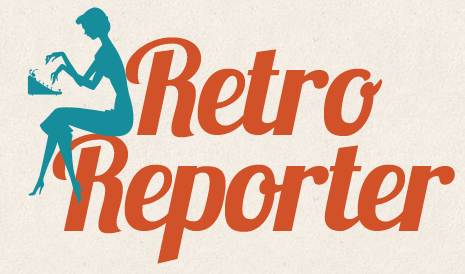 PS - If you are an Alberta vintage girl and are looking to get in touch about events and what not, join our Facebook group! Bailey, Jo and Laurie are absolutely stunning in their stylish clothing! They made a splash at the Elizabeth's Antique Sale this past weekend -- created admiration from the males and inspiration with the ladies! So glad Sheree Zielke was able to capture some of the fun that you had this past Saturday!! Hope to see you again at the next sale, November 1st and 2nd -- same venue and times!